Morgan James Publishing, 9781630479923, 286pp. Conventional wisdom is that organizations have to maintain a normal distribution of A, B and C player employees.CEO's and business executives all prize A Player talent and see its value. 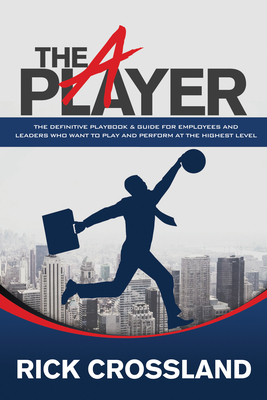 Business people immediately grasp the concept of A Players and the value they offer to organizations. Everyone deserves to be an A Player somewhere; but it is earned and not given. Generations of people have been taught an entitlement mentality towards their jobs and careers. Now is the time to formally teach them how to be an A Player. The A Player defines what an A Player is and how to get there. Rick genuinely walks the talk when it comes to being an A Player. He has almost 30 years of experience developing, recruiting and leading high performers, and developing high performing cultures at companies. Before founding his executive coaching, leadership, and talent development practice eight years ago, Rick held positions of increasing leadership responsibility at Johnson and Johnson, ICI-Zeneca, Planters-Lifesavers, Ford Motor Company, and Limited Brands. He holds a bachelor's degree in Chemistry from the University of Delaware and an MBA from Duke University. In addition to his writing and consulting, Rick is a passionate speaker who loves to captivate audiences with his unique A Player approach.